Like many of us, I am an avid fan of Pinterest. I spend hours on there “oohing” and “aahing” at the wonders some people seem to achieve, especially where people are just painting furniture and coming up with amazing results. However, I have also seen many people talking of Pinterest Fails and I know that sometimes the finished products are never quite the same. One of my goals for this year was to get my creative mojo back. A chance to do something for me, something which made me happy and hopefully gave me an end product I was proud of. I write a lot (blogs, journals, presentations, etc) but had found the writing space I had created at home was slowly being taken over by my children. I didn’t want to revert back to the old faithful dining table, where I had to clear everything away every time we had a meal. 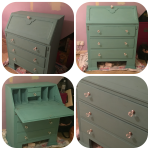 So a writing bureau for my bedroom seemed like a perfect first painting challenge. 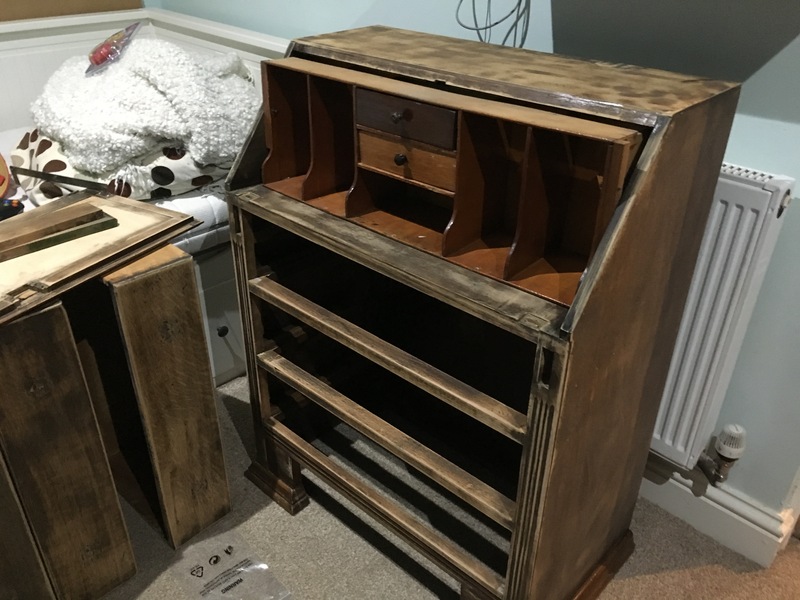 So I headed off to the Antiques Barn in Ashford and purchased an old, tired -looking, writing bureau. 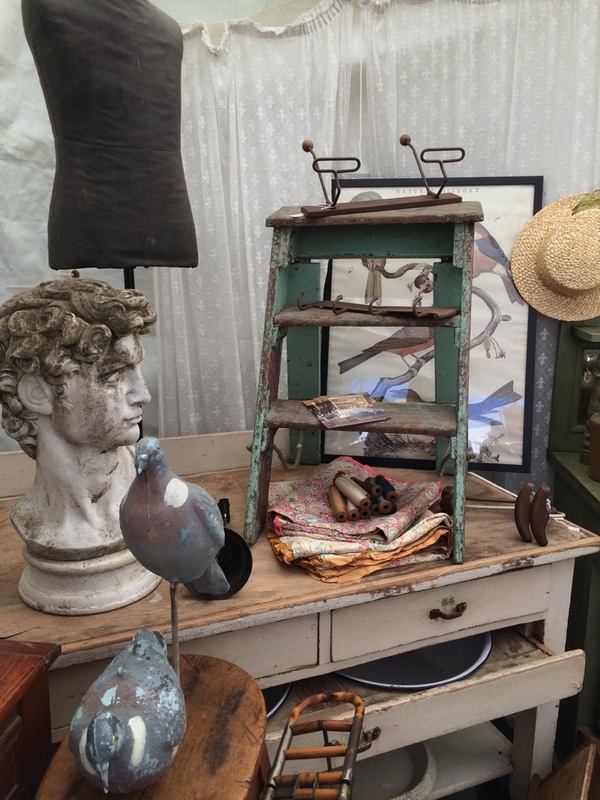 If you have never been to the Antiques Barn, please give yourself a treat and pay a visit. I could spend hours in there and refit almost every room in the house (including the garden). Back to the writing bureau. It was old, in much need of some TLC and after bringing it home, I just kept looking at it trying to get inspired to do something with it. 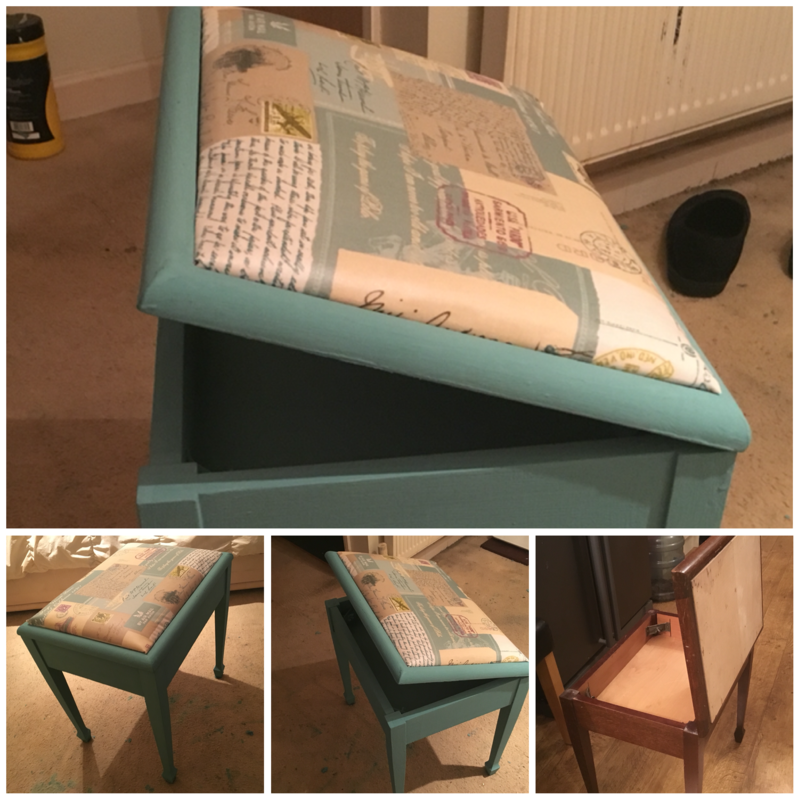 I spent hours on Pinterest and although I loved the idea of painting furniture, actually taking that first step was quite daunting. I spent 4.5 hours sanding the whole thing down. Amazingly, I actually enjoyed this. I found it therapeutic. 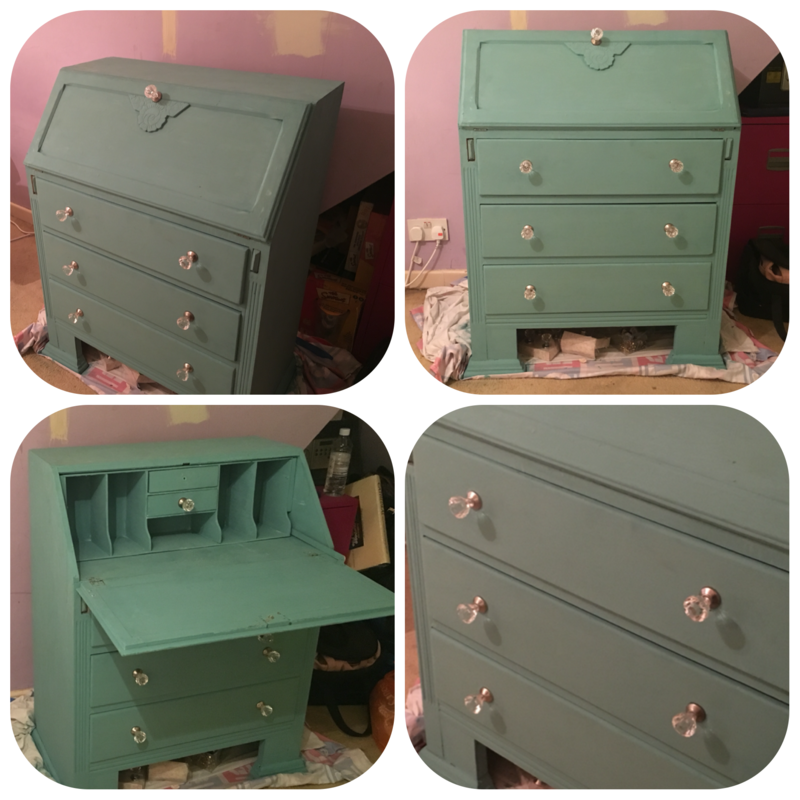 So when I heard that evening, that there was something called Chalk Paint and you could use this without sanding down, I wasn’t quite as annoyed with the 4.5 hours as I may have been. I found a local stockist and then sat nervously looking at the paint and then back at the bureau thinking “this cannot be as easy as everyone says”. But it is. It is so easy. 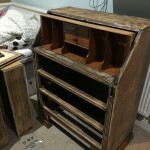 You don’t need any experience, you don’t need a tonne of specialist equipment – just a decent paint brush and some chalk paint. I used Annie Sloan paint but I know there are many others out there. You can even make your own – I will be testing this soon and will let you know if it is a success or not. I watered down the Annie Sloan paint as recommended by a few friends who had used it. I found this really made a difference when applying it. Two coats later, it was time for the wax. Again, there are a lot of retailers saying you have to use certain brushes to do this (costing in excess of £25) or pay a small fortune for lint free material. Rest assured, you don’t. I bought a back of three microfibre cloths for £1 and these worked fine. Now I was on a mission. I needed a suitable seat but I knew I didn’t want any old office chair. I wanted something equally beautiful. So off I went, back to the Antiques Barn. I found a beautiful old piano stool. It had definitely seen better days, the cushioning was ruined, the material was old and torn but the basic structure seemed to be fine. Back home and this time, no fear, no worries. I knew this was going to be a pleasure. I removed the old material and foam. Popped into the local Dunelm to buy some new foam and the local Range to buy some material. And within a day I had a beautiful seat to go with my writing bureau. Pop over to the Antiques Barn Facebook page and share your images. They would love to be inspired by your finished products. Maybe you are looking for something to paint but not sure what? Again, have a look at their Facebook page, they are always adding images of new stock. Pop in, have a look around and have a chat. It really is Aladdin’s Cave, be prepared to see items that you have to have (even though you don’t know where you will put it).